Check out the AX330 and AX990 in the Al Alamiah section. These Arabic MSX-1 computers have a Sega MegaDrive (aka Genesis) built-in! This is the mysterious hybrid of a IBM PC/XT compatible and a MSX2 made by Spectravideo, the SV 838 X'press 16. First of all, THIS IS NOT A MSX! It is a IBM compatible PC/XT with special MSX2 features and the ability to play (most) MSX cartridges via a special adapter! 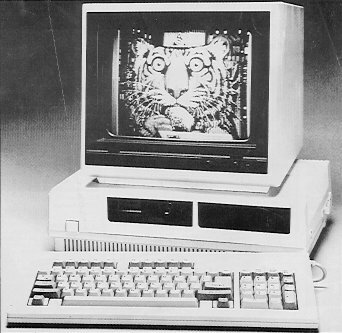 The SV838 has a 8088 microprocessor (speed is unknown) and 256kB RAM, expandable to 640kB. Next to standard monochrome (text) and CGA (graphics) video-output, it has a AVDP (Advanced Video Display Processor) built in. The same one as in a MSX2, with its own 128kB VRAM. In stead of the normal pityful PC-speaker, the SV838 has a MSX-standard PSG. To make use of the so-called 'advanced' features, a special enhanced version of GW-BASIC (called 'Enhanced GW-BASIC') was developed, which is similar to normal MSX-BASIC v2.0. A fun feature is you can super-impose the AVDP and standard CGA output, so you can use MSX2-pictures as a background for MS-DOS applications! The SV838 has a built-in 5.25" 360K diskdrive and the possibility of connecting a second diskdrive or a harddisk. The keyboard is attachable to the system-case and has 83 keys and a numeric keypad. A Quickshot-X analog joystick is included. Furthermore, it has RGB (digital and analog) and Audio output. SVI-811 MSX Game Adapter, compatible with most MSX game-cartridges. The adapter feeds of the SV838 and uses standard MSX joysticks (in stead of the analog PC-Gameport). SVI-812 Low-cost Multifunctional Card, has 384kB RAM, a RS232C port and a real-time clock/calender. SVI-814 PAL RF Adapter, allows connection to a Color TV or composite Color Monitor. MSX is a trademark of MSX Association. All other trademarks are property of their respective owners.